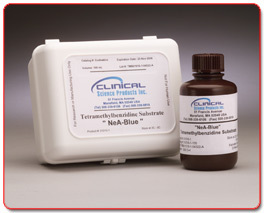 Our chromogen substrate is designed for horseradish peroxide (HRP) based assay systems. Typically, it's immunoassys in the format of microtiter plate, tube or automated. The substrate itself contains both hydrogen peroxide and tetramethylbenzidine (TMB) in a totally aqueous buffer system which stabilizes our unique formulation. The product which we call, NeA-Blue is conveniently provided in a single bottle and is used directly as is. Automation - Being 100 percent water based our TMB substrate is an ideal candidate for automation as it's less likely to react with tubing. Shelf Life - When released and available for purchase, NeA-Blue TMB substrate is stable for 2 years when stored at 2C to 8C.